Wolves can be described as one of the true sleeping giants of the football world, and ever since the redevelopment of Molineux in 1994, this has only escalated. The new Molineux is a sight to behold, and is notable for the fantastically bright and colourful stand. 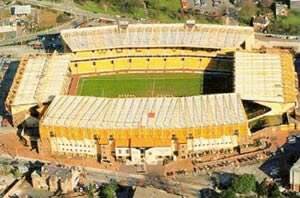 The four separate stands are named after legendary Wolves players and directors (Bill Wright, Steve Bull Stand, Stan Cullis, Jack Harris), and has also been built is such a way, that the ground can be easily extended/improved should Wolves ever get promoted to the Premiership. Within two of the corners, between the stands, are housed two large video screens, which provide highlight of the ground, half times, final scores etc. Away fans are normally located in either the Jack Harris stand (smaller crowds) or the lower half of the John Ireland, depending on the number attending. Away fans located in the John Ireland stand, can get rather a hard time, as they are located in the lower tier, with Wolves fans above. This caused problems in the early days, with various things being thrown over the balcony onto the away fans. The stewards have clamped down on this. That said, Yatesy has dropped us an e-mail, and says 'The problem of the lower John Ireland stand is not sorted as crystal palace and Albion fans will no doubt testify, and it's not just tea they throw, try urine'. For those arriving early, the club also provides tours of the ground. The status of Wolves legend Billy Wright is also worth a look, and is located near the main entrance to the club offices. Alcohol can now be purchased within the ground, but as with most grounds, is not permitted on the terraces. On the various occasions we have visited Molineux, we have not encountered any crowd trouble. That said, the atmosphere at Molineux can be very intimidating for away fans, especially if your team wins! Exit the M6 at junction 10A, follow the M54 to junction 2 and then take the A449 Stafford Road to Wolverhampton. From the A449 this ground is signposted as 'Molineux Centre', but beware as there are speed cameras. As you approach the City Centre, you will come to an island (Halfords on your left), take the 3rd exit into Waterloo Road. Wolvehampton Wanderers Football Club is approximately half a mile along on the left hand side signposted 'Molineux Centre'. Although the stadium is only 300yds away, the 503 and 504 from stand R stop at the ground. Car parking is best described as limited, but if you're early enough you'll be able to get a space within walking distance. There is a car park outside the ground, but this fills up really quickly, is difficult to exit, and is rather expensive (...apart from that it's fine!). There's a large car park on Darlington Street, just off the ring road and there are a couple of smaller ones dotted around the ring road. There is also a large car park in the Civic Centre, but again this is rather a pain to exit, and is very popular with home fans. A member of the FanZone team actually used the Civic Centre car park, and doesn't recommend it, due the problems exiting after the game. He also thought that ?7.50 per car per match was a bit steep! Located in the City centre, this is a nice large pub. There is sky sports on a large screen TV, for those prematch warm ups. The beer is good, with all the usuals, plus several home brew bargains. One the day we visited we drunk several pints of Litten Bitter, which was very good, and cost 79p a pink! There was also good food served all day, and we can recommend the Cajun chicken. This pub is located on the junction of Waterloo Road and Staveley Road, and is very close to the ground. Usually crowded with home fans. Located on Molineux Street, at the back of the John Ireland stand. Again this pub is very close to the ground, and is usually crowded with Wolves Fans. Located right outside the away supports end, near the entrance to the subway that leads to the City centre. We did not go into this pub, as it was really crowded, and the bouncers were letting one out, and one in. This pub is best avoided by away fans, as it was packed with home fans, who didn't appear to friendly. This pub is located at the ground within the Stan Cullis stand. This is a no no for away fans, as it's limited to season ticket holders and members only. This pub is located close to the train station, and serves great real ales. Worth a look, but if there is a large group, wearing colour, you may be turned away. If you are a registered user then you can login, and create your own personal review of Wolverhampton Wanderers Football Club - Molineux. These reviews can be private or public.